History has provided the world with some great art. Though at times, art that meant something to the artist may have been created in an atmosphere of censorship or fear. 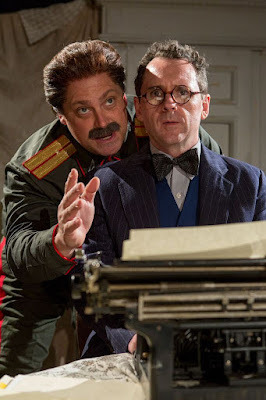 In John Hodge's Collaborators, presented by The Storm Theatre Company, renowned author Mikhail Bulgakov is forced to draft a play about the tyrannical Joseph Stalin in order to save his own work all while losing his artistic and personal integrity. The fictional imaging of the collaboration between Bulgakov and Stalin is the centerpiece of Hodge's piece. With a backdrop of early World War II Russia, Collaborators is an evocative look at the stronghold of tyranny through the lens of art. As the North American premiere of the Olivier Award winning play, this production is luckily carried by Hodge's intriguing story and rich characters. When it comes to execution, Storm Theatre Company's production doesn't quite reach its full potential. Directed by Peter Dobbins, Collaborators wants to be much grander than it is. Where Hodge’s script should live tonally in this production is a giant question mark. There is a strong tonal shift between acts. The first act, while it has moments of weight, has a dominating comedic undertone. And it’s very much appreciated. By act two, when things get real, the laughs are almost completely eliminated to make way for a seriously heavy drama. It feels like two drastically different plays. When Stalin loses his droll, the play takes that shift as Stalin is the glue that patches the humor into this world. Tone aside, Dobbins’ care of Hodges’ characters is strong. He allows them, even if they are a tad farfetched, to have an aura of honesty which makes the Great Purge of Bulgakov’s friends and colleagues even more heart wrenching. Dobbins highlighted the commentary on tyranny and manipulation well allowing the story of art and politics to shine through. Though it was likely a choice that the script may call for, the production was done sans Russian accents, though one rogue actor incorporated it occasionally. This did add a slight level of comedy as hearing a person seriously say “comrade” without a Russian dialect is funny. From an acting standpoint, the company tackled the characters head on. Whether the character had a devastating journey or served to extend the commentary, strong choices were present. Right? That's a different discussion. And no choice was stronger than Ross DeGraw’s interpretation of Joseph Stalin, the monster that haunts Bulgakov’s mind. There’s no doubt DeGraw has a knack for character acting. But his take on the dictator is certainly not for everyone. The mustache may aid in the comparison but the best way to describe his performance is Ross DeGraw as Ron Swanson as Joseph Stalin. From a comedic standpoint, DeGraw is a riot, but no other actor played in this world. While he provided a different style of humor, Robin Haynes as Vladimir is exquisite. Haynes brings the fear as the NKVD officer but when he puts on the director hat as the leader of Bulgakov’s play, Haynes is jovial. Brian J. Carter as Mikhail Bulgakov is able to control what could be an emotionally explosive by grounding himself, allowing Bulgakov’s physical and psychological rollercoaster to be honest. Rounding out the strong performances were Erin Biernard as Bulgakov’s loyal to a fault wife Yelena and Jessica Levesque who tells an enthralling story as a woman who cleans up after executions by simply using body language, physical tempo, and minimal words. Collaborators is a piece that can be played in a more realistic world or exploring the theatricality of Hodges’ text. Dobbins and his design team took a more realistic and intimate approach of design. Staged in the basement of a church, there were natural echoes and the clanking of a heater. While the elements may have been a occasionally distracting, the design components that were intended were tight. The set by Rebecca Grazi evoked the period and intimacy of a small apartment housing an exuberant amount of occupants. Dobbins used this space well but rather than incorporating the various locations into this space, he utilized the open area of stage left for the theater scenes. And no matter where you were sitting in the audience, it caused some unfortunate neck straining. With so many scenes living in that space, it’s possible that you gave up watching if the scene exceeded two minutes. The lighting design by Michael Abrams was clean. The way he used the light through the closet for Stalin’s haunting was striking. It’s clear why Collaborators was granted the praise it did in London. John Hodge has penned something spectacular. Storm Theatre Company went the simple route with the production. And it didn’t quite suit the play.